In addition to bolstering strategic ties with the United States, Vietnam is also building a strong strategic relationship with other partners, particularly India, that are skeptical of China’s growing power in the Asia-Pacific. U.S.-Vietnam strategic ties have been solidifying for years. Vietnam also has hosted multiple port calls in Cam Ranh Bay, purchased a major Coast Guard cutter from the United States, and Hanoi and Washington have a robust, high-level strategic dialogue that has, in recent years, expanded to include a broad range of shared security concerns. U.S. officials welcome Vietnam’s approach to the South China Sea, as Hanoi has a professional military, a skilled set of senior officers and analysts, and generally a tough style in dealing with Beijing’s activities in the South China Sea. Yet while the U.S. aircraft carrier visit received substantial press coverage, another aspect of Vietnam’s evolving strategic strategy—one of strengthening its relations with a variety of regional powers skeptical of or outright hostile to China—was not covered as widely in global media outlets. 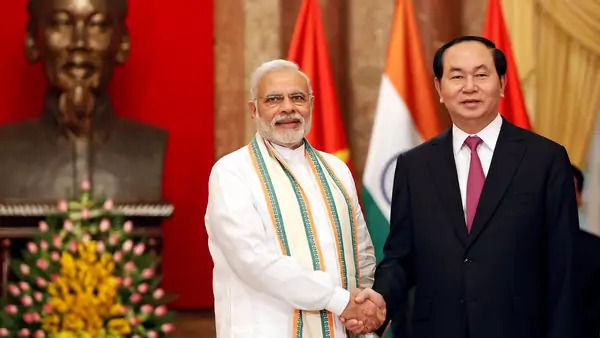 Indian Prime Minister Narendra Modi hosted Vietnamese President Tran Dai Quang and a delegation of Vietnamese officials last week. During the visit to India, the two sides discussed joint exploration in the South China Sea, announced again their shared commitment to freedom of navigation in the South China Sea, discussed plans for Vietnam to purchase more defense equipment from India, and inked agreements to further cooperate on civil nuclear issues, as well as agriculture and other areas. As I recently wrote in World Politics Review, although the Trump administration has vowed to take a tougher approach to the South China Sea than its predecessor, and though it clearly is attempting to woo Vietnam—an approach in line with decades of warming U.S.-Vietnam ties—Hanoi remains concerned about aspects of U.S. strategy in Southeast Asia. Hanoi also wants to cultivate a broader set of partners, beyond the United States, who could bolster Vietnam’s approach to the South China Sea and could present an anti-China strategic bulwark generally. While Hanoi clearly appreciates a U.S. approach to the South China Sea that uses more regular freedom of navigation operations and (at least rhetorically) pushes back harder against China’s militarization and land reclamation, Hanoi also has doubts about the long-term sustainability of the U.S. posture in the South China Sea. In addition, the Trump administration’s trade policies are not well-liked by Hanoi, which is part of the Trans-Pacific Partnership, and the overall seeming unpredictability of the White House is not a great fit for Vietnamese leaders. To fill this gap, Hanoi has been wooing a wide range of other regional partners. Some, like South Korea and even Australia, while possessing growing strategic and economic power in Southeast Asia, remain wary of doing anything in the South China Sea that would be highly alienating to Beijing. Others, like Singapore and Japan, are limited in their ability to partner with Vietnam on South China Sea-related issues by their constitutions or their size. But India, with a blue water navy, a similar level of skepticism of Chinese foreign policy as Vietnam, a willingness to throw Delhi’s power around in the South China Sea, and a desire to have a long-term, sustained security presence in Southeast Asia, is in some ways an ideal major partner for Vietnam. In fact, Vietnam is now at the heart of India’s Look East strategic policy. Yet all signs suggest that India and Vietnam are going to continue with this plan of joint exploration, and possibly attempt to involve companies from a third country as well, no matter what China says—a significant sign of India’s growing cooperation with Vietnam on South China Sea issues. In addition, India likely will continue its line of credit to Vietnam to purchase Indian defense equipment and eventually increase it, in order to allow Vietnam to purchase more weaponry from India. Delhi and Hanoi also have major concerns about China’s Belt and Road Initiative—although Vietnamese officials are less wary than Indian ones—and the two sides may, in the future, want to be close partners to some other future regional alternative (or at least, partial alternative) to Belt and Road.